Children’s Hospital Los Angeles is one of the finest pediatric medical centers in the nation in part because we know that addressing the emotional challenges our patients face during treatment and recovery results in better outcomes. By providing a variety of emotional and psychological support services, such as the Child Life Program and the Mark Taper-Johnny Mercer Artists Program, we are leaders in the field of family-centered care, which are essential to the well-being of patients and families. For a listing of upcoming events designed for Patients and Parents, check out our calendar of events. Connect with our hospital on social websites like Facebook, Twitter, YouTube, Flickr and our blog. Stay in touch and help us spread the word! From community health improvement services to education and research -- Children's Hospital Los Angeles collaborates with families, civic and community organizations, government agencies, educators, researchers, child advocates and policymakers to improve the health of the children and adolescents in local communities and across the region. Read more. The Children's Hospital Los Angeles gift shop is a friendly and helpful boutique offering parents, visitors and staff the essentials they need for one day, one week or longer stays at the hospital. Some of our most popular items are phone chargers, warm sweatshirts, slippers, basic toiletries and toys. Hours of Operation: Monday through Friday, 9 a.m. -6:30 p.m. and Saturday through Sunday, 11 a.m. to 5 a.m. Phone: 323-361-4134. How are we doing? Tell us about your hospital stay. Is there something we did well? Is there something not going well for you? Please give us your feedback and let us know if we are meeting your needs. Here is an at-a-glance list of important phone numbers that may be helpful to you. Parents and caregivers have the right to an interpreter at no charge. This includes all patients and families who are hard of hearing or visually impaired. Prescriptions may be filled at a pharmacy of your choice. For your convenience, there is a Walgreens pharmacy on the third floor of the hospital’s Outpatient Tower. Walgreens is open Monday through Friday, 8 a.m. – 7 p.m., and Saturday, 9 a.m. – 5 p.m. Click here for more information or call 323-644-2080. We offer classes in both Spanish and English to parents about common child health topics. To find out more about this program and for a schedule of classes, please visit Parent University . If you are new to our hospital, this is a great place to find stories from other families who have shared their child's health care journey with us. In addition, we invite you to Share Your Story with us too! 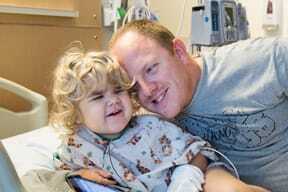 Children's Hospital Los Angeles encourages you to engage in open discussion on our social media sites. We look forward to reading your comments about your experiences. Social media is also a great way to stay connected to family and friends. While keeping friends and family updated on social media is easy and convenient, we recommend you take a moment to look over the Social Media for Families information flier. The Human Subjects Protection Program (HSPP) at Children’s Hospital Los Angeles is responsible for the ethical and regulatory oversight of research conducted with human subjects. The program is accountable for providing education and training to the research community at our hospital. On a Pre-Surgical Tour, we will orient your child and family members to Children's Hospital Los Angeles and our caregivers will be on hand to answer your questions about what will happen on the day of your child's procedure. Phone: 323-361-8219. The Mark Taper and Johnny Mercer Artists Program brings together local artists and musical performers with registered and certified Creative Arts Therapists to our hospital. Check out our YouTube video about the program! An entire team of dedicated professionals are responsible for your care. We have posted descriptions of the caregivers you are likely to meet while you’re here. Your parents may contact any of your caregivers at any time to answer questions. When you come to our hospital for an appointment or stay overnight for treatment, you may encounter someone’s pet – a friendly volunteer dog – along the way. Our hospital is fortunate to have a Dog Therapy Program that allows approved volunteers to bring their pet dog to the hospital to visit with you and your family. Check out photos of volunteer therapy dogs on our hospital’s Flicker page! A view of the playground from a patient room. 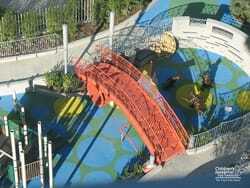 Click on the image for more playground pictures. 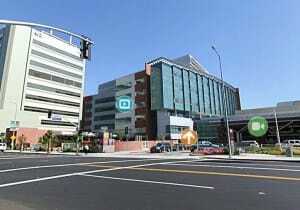 The playground at Children’s Hospital Los Angeles is located just off the HBO Café. The spot is meant to be a relaxing place for patients and families. It is a place for kids of all abilities to play together. With a spongy fall surface throughout the grounds, kids are invited to steer a pilot’s wheel, peer through a periscope, sway back and forth on a wheelchair-accessible glider and prop themselves up with the help of strategically placed handle-bars to count on an abacus – activities that are physically and mentally challenging and fun. Therapeutic play sessions take place in our playrooms and at the bedside. Playrooms are safe places for children to build coping skills, express creativity through play and share emotions and concerns. To help you feel comfortable and special when staying in our hospital for treatments, we can provide you with a toy to recognize a significant milestone, such as a medical procedure or your birthday. If you are a patient, Food options will depend upon your medical condition, however special requests and home-cooked meals may be possible. Ask your caregiver for more information. We realize the holidays are a special time of year, that’s why our volunteers and staff put so much time and effort into making it special for you and your family. Around the Christmas holiday, the hospital puts on a party in the Teen Lounge for teenagers and their families, which features delicious food, sweets, arts & crafts projects and special entertainment. The child athlete is physically and emotionally different from the adult athlete. At the Sports Medicine Program at the Children’s Orthopaedic Center, we treat all sports injuries, from the simple to the complex. Teen Impact is a program at Children’s Hospital Los Angeles for teens and young adults that have or once had cancer or a blood disease. If you’d ever like to become a volunteer at our hospital, the first requirement is to be at least 15-years old. Visit our volunteer information to find out more about the volunteer program, including requirements and how to apply.